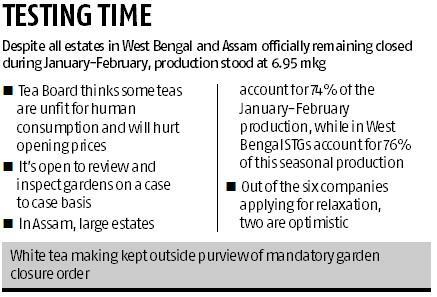 The Tea Board’s decision to implement mandatory closure and opening dates for tea gardens across West Bengal, Assam and other states has left at least six tea-producing companies distraught, with some claiming to be losing crores of rupees due to this move. Last year, for the first time in its 40-year history, the Tea Board mandated that all tea gardens in West Bengal should be closed from December 15, 2018 till February 10, 2019, so that around 30-40 million kg (mkg) of inferior quality tea goes out of the market, paving the way for improved prices at the auctions. Assam gardens were asked to remain closed between December 10, 2018 and February 18, 2019. The move has ostensibly been made in order to improve the quality of Indian tea, which has come under scrutiny in major export markets lately, due to the presence of pesticides and chemicals beyond permissible limits. At least six companies from the two states have appealed to the Board to allow plucking of leaves before the official date. “In a 300-hectare garden, we had pruned 10 per cent of the area in August last year to make some specialty green and premium CTC (crush, tear, curl) tea. We had started plucking these leaves during November-December, which ideally should have continued during January-February; but we had to stop operations,” said Sajjan Bagaria, executive chairman, Mainak Hill Tea Estate. Together with T&I Global, Jay Shree Tea, M K Shah Exports, Nuxalbari Tea Company, Oodlabari Tea Estate and Darjeeling Impex’ Namring tea estate had applied for commencement of plucking before the mandated date. D P Maheshwari, managing director and CEO, Jay Shree Tea claimed that owing to the Board’s order, his company may suffer a potential loss of Rs 10 crore while Namring is estimated to have lost an opportunity of 100 kg of specialty teas valued at over $200 a kilo. “The decision to close the gardens and resume on the mandated day was taken so that prices improve. So far, we have only seen the prices of lower tea grades improving, while those for upper grade tea have been stagnant,” Maheshwari said, adding that while the Board’s order hasn’t been able to address price improvement, it has led to losses for his tea estates. Himanshu Shah, chairman at M K Shah Exports, which recently acquired some prized gardens from McLeod Russel in Assam, claimed that their garden practice, including early pruning, allows them to harvest tea bushes earlier than other estates. “If we are not able to harvest the bushes before the Tea Board’s mandated date, we may lose revenue of Rs. 3 crore. Tea Board inspectors have already visited our gardens and I am waiting for what the Board finally decides”, Shah said. In some estates, despite gardens being officially closed, tea production continues. During January-February 2018, despite all tea estates in West Bengal and Assam officially remaining closed, production from Assam stood at 1.96 mkg in Assam and 4.99 mkg in West Bengal. 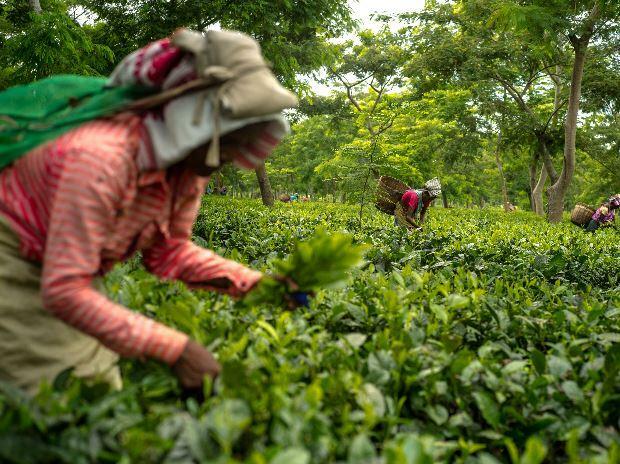 Interestingly, in Assam, larger estates account for 74 per cent of the tea produced during the garden closure period while in West Bengal, it is the small tea growers who produce 76 per cent of the tea during these months. Roy, chairman at the Tea Board doubts the quality of leaves which are produced at this time of the year, he said, “We will inspect leaf quality at the gardens whenever individual gardens approach us. If their leaf is found fit to be harvested, we will then decide on their plea of relaxing the mandate on those specific gardens”. According to Roy, tea leaves in north India during this season are "sub-standard" and the tea which can be made out of these leaves are "not fit for human consumption". “These leaves are bound to fail the quality parameters. It is in best interest of the industry if plucking doesn’t resume before the mandated dates”, Roy concluded. While Tea Board officials are keeping a tight vigil on the tea processing factories, it has allowed plucking of fine tea buds for making specialty White tea. Such tea is sun-dried and doesn’t need any machinery and factories to make tea. Mostly sold via private deals with buyers, this tea fetch exorbitant prices. Around 0.5-1.5 million kilo of such tea can best be produced in a year.